The Sustainable Development Goal Nr 17 wants to strengthen the means of implementation and revitalize the global partnership for sustainable development. Vanessa Rueber and her colleague Matthias Gremlich are working for Patagonia. 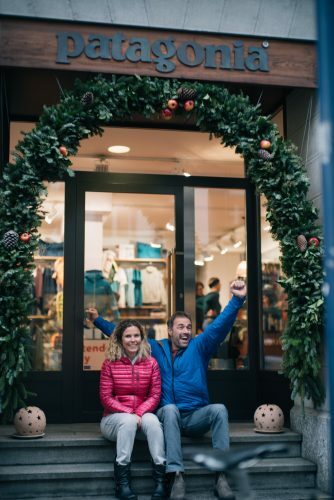 Vanessa and Matthias have been building up the Patagonia brand in Switzerland for the last three years. Matthias is running the Patagonia showroom in Glattbrugg. With Zurich offering the right platform of people who are interested in the environment and clothing, Vanessa is hosting events at the local Patagonia store and keen on meeting local NGOs who are interested in collaborating on environmental issues. One of the things Yves Chouinard is famous for, is taking his employees surfing. What of that spirit is still alive, now that Patagonia is a global company? Vanessa: We still go surfing, skiing and jogging during work. Last year, we could count on our fingers how many times it snowed. You can be sure, that I was out there skiing every single time. Not every company lets you pick up your skis when that happens.You have to get your work done, but as long as you do that you can also take the time to go outside. Playing outside is still a core value at Patagonia. This is Matthias hitting the slopes. How is Patagonia contributing to Sustainable Development Goal #17 – Partnerships for the goals? Vanessa: Most of our clothing is fair-trade and we try to give back to the communities we work with. We have a program called 1% for the planet, where 1% of our sales go directly towards programs for the environment. Every 6 months, we give out grants to NGOs – up to CHF 15000 each and we want to find more NGO’s in Switzerland who can apply for the grant. The application through an online form is straight forward. Each year we have two selection rounds: one in January and one at the end of June. In Switzerland we currently support two NGO’s (STOPPP and Film für die Erde), in Europe overall we support 50 NGOs. Beyond the financial support we help them create synergies and build partnerships with other organisations that can help them reach their goals. We also have an enviro program for employees. Everyone at the company can take one week to three months off to support an environmental initiative or NGO – help save whales, go clean up lakes, demonstrate against dams – while still being payed by Patagonia. How long are the partnerships you are building through the grants you give? Vanessa: The grants are given for one year and can be renewed every year. You cannot apply twice a year, but you can re-apply the year after for the grant. However, my goal – and I am currently on my own in Switzerland with two sales reps on my team – is to be able to collaborate also with the NGOs that didn’t get a grant and help them find other ways to make money or receive funding. For example by giving them clothing for a swap or engaging them in our events. POW – Protect our Winters Switzerland came to us and asked if we could support them. 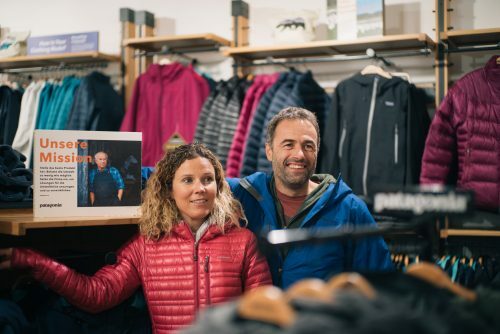 They are too small and don’t have the capacity to apply for the grant yet, but the founder came to one of our events at the Patagonia store in Zurich and talked about what he does. He also sold T-shirts there and distributed stickers. Beyond the grants how else can organizations engage with Patagonia as a company? Vanessa: Especially now, we collaborate with NGOs in the Balkans, because we are supporting the movement against building dams for hydropower. We believe there are environmentally friendlier ways to generate renewable energies that are less invasive and we help the local NGOs to find people who will join their protests. We are also running a tools for grass roots workshop in the spring with 60 people from various NGO’s. They go on a three day weekend and camp out together. We invite speakers who support the NGOs with everything from bookkeeping to how to organise demonstrations and protest. Sometimes the NGOs are so focused on their cause and environmental action that they forget to build and run their own organisation successfully and neglect how much money they have in the bank. What are you looking for in the people and organisations you work with? Vanessa: We are looking for organisations and people who share our values, who are green and focus on environmental issues. They should like the outdoors and are actively doing something for the planet. STOP for example is cleaning up rivers and lakes with people in the community. Film für die Erde is educating people about environmental problems. They provide a direct link between environmental issues and doing something on the ground. How does a successful partnership with an NGO look like? Vanessa: Most important to me is that they are happy with our support and collaboration. I feel bad right now, because we are such a small team in Switzerland and I feel like I can’t be there enough for them. I would like to do way more to support them, beyond giving them the grant money and a lot of freedom to spend it. It’s really being there for them and helping them build relationships that matter while they are so small. I also would like to be more in Zürich, organise Patagonia events with them and reach out more to the other parts of Switzerland which are not growing as much in the environmental space as Zurich. Is there a story you could share about an existing partnership? Vanessa: One day with STOPPP we went and cleaned up Lac Léman together with one of the local schools. It was a surprise. At the lake, the teachers and I thought, what are we going to clean? The organizer from STOPPP said:” you would be surprised.” She started to scrub through the dirt and all this rubbish and plastic came up. There were tons of Q-tips, cigarette butts and little pieces of plastic. We thought, wow, she is actually right, it is really dirty, even if you cannot see it right away. We found so many cigarette butts by the lake at the clean-up day. They must’ve been there for a while because the paper was all gone. And still, I had some of the fathers tell me, no, no, don’t worry the cigarette butts disintegrate. Even so you think everyone is educated and should know – they don’t know. The competition in the world of closing must be pretty fierce out there. How do you deal with the pressure as a company? Vanessa: We have to stand behind what we believe in. Patagonia stands strong behind the environmental aspect and we really push it. Yes, we are about making product and selling product. I have worked for other clothing companies before, but when we meet at Patagonia, we don’t talk about our products, we don’t talk about clothes. We talk about the environment. We talk about worn-wear and how to repair clothes. We talk about current environmental issues as the national parks in the US that Trump wants to make private land now. I think that’s the difference to other outdoor brands. When people see little differences like that, they hook onto us. Matthias: Sometimes with innovation we are actually a little behind the market, because we want the product to be perfect. We have an ironclad guarantee, a lifetime warranty on every product we sell. If they break and we can repair them, we will, so you can keep wearing it. And of course if it is completely broken, we do give you a new one. We do internal testing on our clothes and they have to pass, otherwise we don’t bring them to market. What else is different about Patagonia? Matthias: We are one of the last privately owned outdoor companies. Because it’s privately owned we do have a lot more money to do the things we want to do: to help others, to inspire others. And we can do things like filing a law-suit against Trump and the US government for turning park-land into private property. A publicly owned company would have to get agreement from their shareholders. Perhaps 50 of them would say yes and 50 of them would say no so no, so you wouldn’t get anywhere with it. Patagonia owner Yves Chouinard said, he created his brand to go outside and be in the outdoors. The two parks are national lands and now they are no longer fully protected. As an outdoor brand we have to protect our playground and that’s why we put together the lawsuit. Now there are other brands that have jumped on the wagon with Patagonia. How can the members at Impact Hub Zurich get engaged or collaborate with you? What is your biggest wish for the future? Vanessa: It is mainly through our events, that we can engage community members. Go to the Facebook site and you will find different events in the spring that we would love to collaborate on. We we will, for example, run a worn-wear event at which you can get your stuff repaired. We are also trying to find out if and how we can publicise more about the NGOs we are collaborating with. Vanessa: Maybe that in the future, on December 12, at the beginning of winter there will be as much snow as we have this year. That we don’t have 20° Celsius like last year at Christmas, that we have the right climate for the right season and that overall it returns to what it should be. 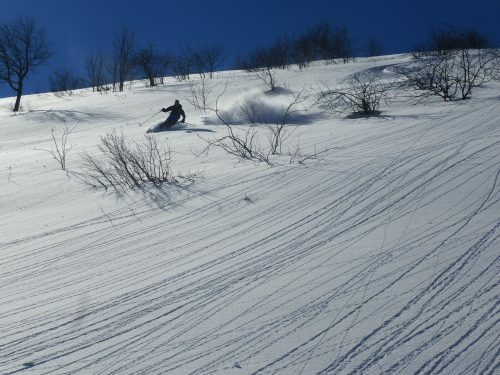 That our kids will know what we knew and that they can go skiing in winter and swimming in the summer. Matthias: My wish is to really inspire others and help them jump on the train becoming environmentally sensitive. That’ a big wish and a big goal. I think that’s the way to go. Every person makes a difference.